Lamborghini’s reputation as one of the key players in the superluxury segment is based on the performance of its cars. The brand has however has recently acknowledged that in-car technology is just as important when it comes to attracting customers. The company’s COO, Alessandro Farmeschi said in an interview to Digital Trends that Lamborghini customers are highly demanding when it comes to technology and the brand has plans to ramp up this factor in its new models. Most Lamborghini buyers fall in the age group of 35 to 45 and are generally young entrepreneurs who have plenty of technical knowledge or come from technical backgrounds. Hence, the future models from the Raging Bull will focus heavily on the electronics aspect. The latest Lamborghini model, the Urus has a number of innovative technical features including a pair of touch screens on the center console. Maurizio Reggiani, the company’s head of research and development, said that the level of connectivity in the Urus will serve as a benchmark for Lamborghini’s super sports cars, with more and more buyers seeking advanced connectivity and infotainment options. 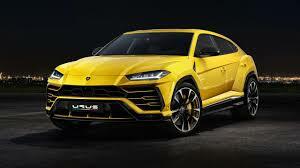 Reggiani also said that Lamborghini has no plans to launch another SUV that would be at a price point which would be lower than that of the Urus as it would affect the brand positioning.